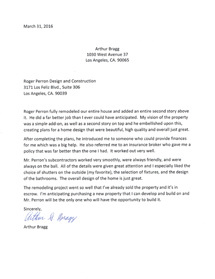 Bragg » Roger Perron Inc.
Roger Perron fully remodeled our entire house and added an entire second story above it. He did a far better job than I ever could have anticipated. My vision of the property was a simple add-on, as well as a second story on top and he embellished upon this, creating plans for a home design that were beautiful, high quality and overall just great. After completing the plans, he introduced me to someone who could provide finances for me which was a big help. He also referred me to an insurance broker who gave me a policy that was far better than the one I had. It worked out very well. Mr. Perron’s subcontractors worked very smoothly, were always friendly, and were always on the ball. All of the details were given great attention and I especially liked the choice of shutters on the outside (my favorite), the selection of fixtures, and the design of the bathrooms. The overall design of the home is just great. The remodeling project went so well that I’ve already sold the property and it’s in escrow. I’m anticipating purchasing a new property that I can develop and build on and Mr. Perron will be the only one who will have the opportunity to build it.